We have a new word for today, boys and girls. The word is “nepotism”; can you say “nepotism” boys and girls? Very good. For those of you who don’t know, nepotism is the action of giving benefits to relatives rather than to others that may be more deserving. For instance, when the CEO of PowerMart decides to hire his nephew as Vice-President of Bacon Acquisition, that’s nepotism. When a coach decides his 4’3”, 72 pound son should be the starting QB, that’s nepotism. Or, dare we say it, when a pastor decides his son(s) should be the associate, assistant, youth, and music ministers, that’s nepotism. Of course, that’s assuming that the sons are not actually the most qualified candidates. There is a chance that they actually are the best people for the job; and then it’s just more awkward than nepotism. But still fairly suspicious. In any case, the concern over nepotism is surprisingly more cultural than you might think. 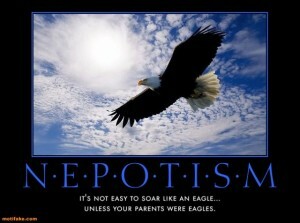 In many parts of the world, nepotism is not only expected, people are actually surprised that we have a problem with it. 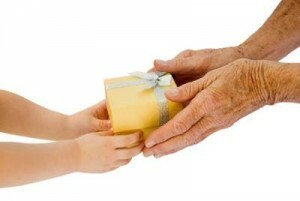 If you suddenly had a million dollars, wouldn’t you give some to your children? How is that any different than giving them a job if you are successful? Seems kind of weird to us, but it does make a kind of sense. Let’s look at example in the Bible. In I Chronicles 26: 6, we learn of Shemaiah and his sons, all of whom leaders in Israel. However, notice that the Bible describes the sons as “very capable men.” Chronicles implies that, even though these men are related to a leader, their own positions were given because they were capable, not because they were Shemaiah’s sons. Time to go for the day. I feel the need to elect myself to the position of Executive Thin Mint Tester. It’s a tough job, but somebody’s got to do it. Not that long ago, it was the big rage to write books with titles that highlighted the differences between men and women; often with fairly lame attempts at humor. “Men are from Mars, Women are from Venus,” “Men are Knights, Women are Queens,” “Men are like bacon, Women are like better looking bacon.” (yes, I made that last one up. 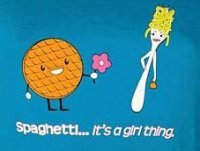 sue me) One of the many incarnations of this theme is one called “Men are like waffles, women are like spaghetti.” The idea is that men tend to separate different aspects of their life into various “spheres,” while women tend to see interconnections between everything. This idea of spheres of influence is surprisingly controversial in our time. Not regarding men, which everyone recognized (which is why a man can see no connection between the 18 hours of golf and his wife’s exasperation), but in the public sector. In our western world, we see distinct separation between various aspects of our life: church goes here, politics goes here, family goes here, sports goes here, etc etc. However, the Bible does not see the world in the same way. This is particularly notable in the relationship between the state and religion. While many ancient cultures had a unity between the secular and religious, few cultures integrated them as thoroughly as the Israelites. Look at I Chronicles 25:1. David is selecting clans for serving in the temple, particular for what we would call “worship” ministry; including singers and musicians. So who does he ask for advice? The commanders of the army. Can you imagine this in our time? What if the pastor of your church called the local ROTC to help choose a worship leader? Or if the Pentagon choose the pastors for American churches? In our mind, these are two totally different areas of life. The politico-military establishment has no place in the sacred; but in the Israelite mind, they were intimately connected. The soldiers fought the wars of the LORD, and the singer commemorated those wars (and sometimes led the troops). In God’s world, He doesn’t just want one square of our waffle, he wants the whole plate of spaghetti. We can’t put God in a little aspect of our life (which, let’s face it, we like to do so we can “control” just how much influence God has in our lives). God wants total and complete integration of our worship and the rest of our lives. How would it change your approach to your work today, if you really believed that everything you did was an act of worship? Gotta admit, sometimes it’s hard to find much inspiration in the story of Israel’s monarchy. Let’s summarize: King so-and-so is a dirt weasel, he is assassinated and succeeded by King Loser, who is also a dirt weasel and is assassinated, and then followed by King Needs-a-Life, who decides to break the mold and become a super dirt weasel. What an inspiring story. Unfortunately, throughout the bible, it seems that both good bad habits can be transferred to future generations. Abraham passed his faith to his son Isaac, who passed it to Jacob, who passed it to Joseph; in the same way, Jeroboam passed his wayward ways on to his kids, who passed it to their kids and successors. Of course, the Bible is also clear that God (and men, to some degree) can break these patterns, but it seems that there is often some type of moral inertia that has to be overcome first. And just to prepare you, it often takes quite a bit of effort to right the ship once it starts rocking. But there is hope, and that’s what Jesus is all about. We need to be careful that the legacy we leave for our children (and future generations, should you not have kids) is one that is pleasing to God. Sometimes we think that our actions only affect ourselves, but the Bible is clear that even our “secret” sins can affect those around us (hello, David). Additionally, secret faithfulness is also contagious (hello, woman with issue of blood). Today, the goal is to have our secret lives be worthy of being recorded in the Bible (the good ones in the Bible, that is, not like that doofus David).